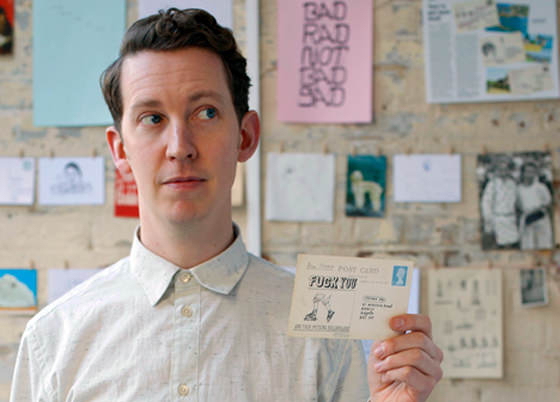 TVO’s favourite abusive cartoonist Mr Bingo is a busy chap at the moment, with public appearances and interviews aplenty! Sadly all the tickets for Bingo’s afternoon talk at tomorrow’s Reasons To Be Creative festival in Brighton have now sold out, but you can still follow the event via twitter and facebook. Take a look here for more information about the festival and to see who else is speaking. Finally, why not have a read of a recent interview he did with arty/lifestyle/travel website, Voyages D’Etudes? In the interview he talks about his love of strange postcards and how they became the medium for his most famous art project, Hate Mail. Click here to read the interview (you can then click through 13 pages in total, which isn’t as overwhelming as it sounds – many of the pages are postcards). Bon voyages!